Topographic data compiled by: Smith, W. H. F. and D. T. Sandwell, Global Seafloor Topography from Satellite Altimetry and Ship Depth Soundings, Science, v. 277, p. 1956-1962, 26 September, 1997. The Galapagos Islands are located on the equator (in the Pacific Ocean), six hundred miles (1000 km) due west of Ecuador. These oceanic islands are of volcanic origin and have been building for the past four to five million years. The volcanic history of the Galapagos hot spot can be traced by the two adjacent submarine ridges, the Cocos and Carnegie ridges. 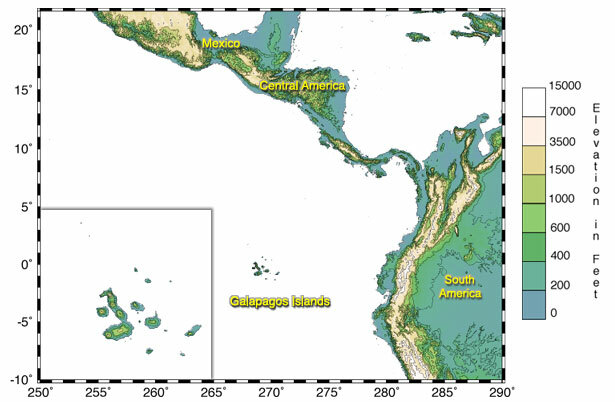 The Cocos ridge extends from the Galapagos Islands, to the northeast and subducts beneath Costa Rica. The Carnegie ridge extends from the islands, to the east and subducts beneath Ecuador. Each ridge is abruptly cut off from the Central and South American mainland by the Peru-Chile trench.